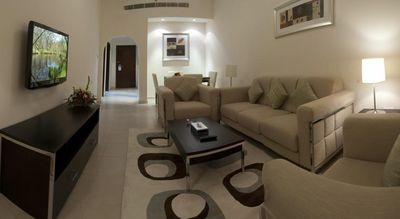 2BR JBR Luxury Apartment with beach access! 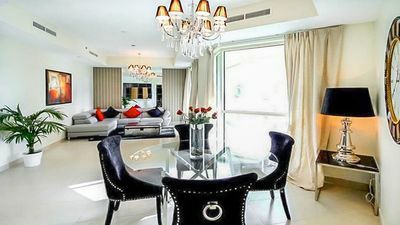 This two-bedroom apartment in Shams, JBR boasts contemporary décor, dramatic sea views and an easy access to the stunning sandy Dubai beach. 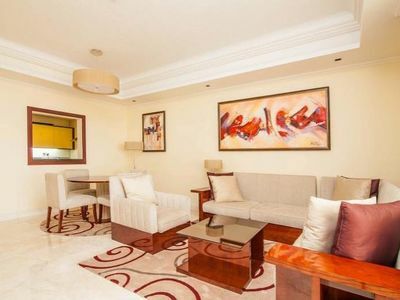 This property is central to the paradise that attracts the rich and famous from across the world. Enjoy the refreshing shamal (Northwesterly wind) – also that’s probably where it gets its name from - winds while lounging on one of the lounge chairs located near the outdoor swimming pool and on the beach while soaking up the shining sun. Grill up a casual mean in the BBQ area near the beach and make your own dream nature picnic. 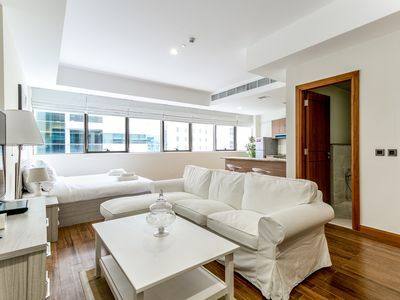 With Wi-Fi access throughout the apartment, you and your family can stay connected during your stay. The interiors of this chic two-bedroom home offer sleek furnishings, bright ceilings and stylish décor pieces. 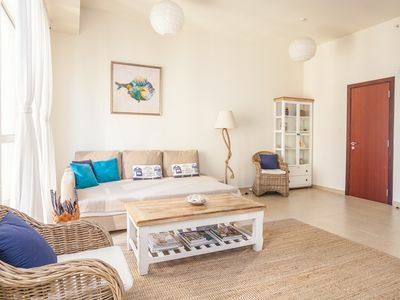 The main living room and dining area are spacious with an oceanic theme like that in the atmosphere and splash of electric blue that gives life to these rooms. 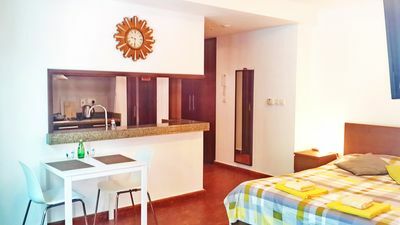 The gourmet kitchen is fully equipped for you to create a home-cooked meal with stainless steel appliances, and gadgets like a stove, oven, dishwasher, washing machine, microwave, kettle and kitchen utensils. 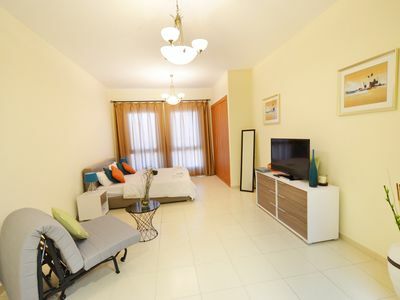 The apartment’s two bedroom are divided on two sides of the house and can comfortably sleep up to six guests. 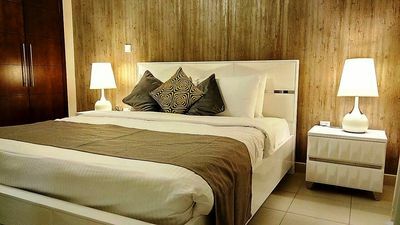 The bedrooms have king-sized beds, with two other sofa beds for guests. They have ensuite bathrooms with showers and air conditioning. 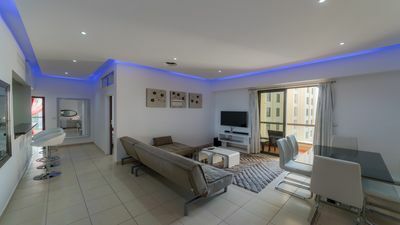 The easy access to the Beach and JBR walk is one of its key features and views of the sparkling blue sea and the Palm will leave you speechless! 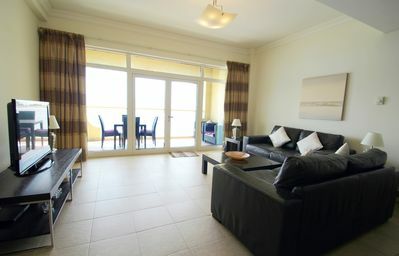 •	The living room is the heart of the place with full-length glass windows overlooking the beach and The Palm. 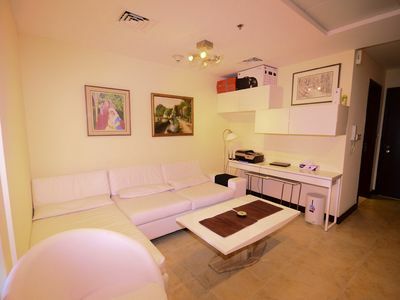 •	6 persons can comfortably sit on sofa sets and dining set in living room. •	Decent sized balcony to accommodate 6 people. 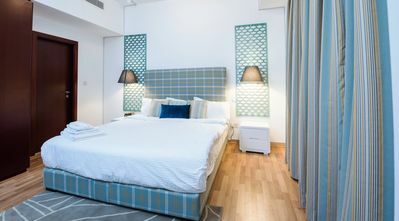 •	Each room in the apartment has a ceiling to floor glass windows, featuring JBR city and creek views which look extra beautiful at night with gold lights lit up. 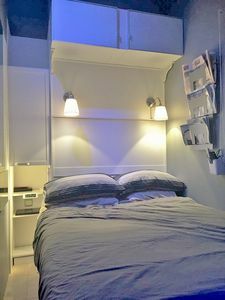 •	The bedroom has king-size bed, en-suite bathroom, and closet. •	The main bathroom contains a shower, bathtub, toilet, large mirror and small cabinets. 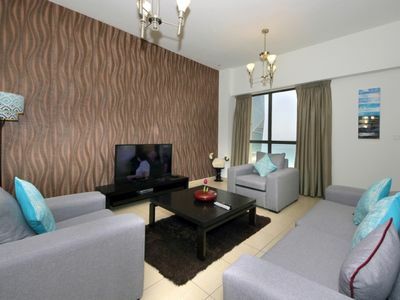 Shams 4 is a prime development prominently located at the beachfront of the Hotel and Retail Belt of JBR. 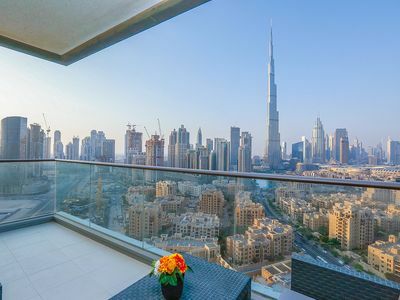 It is the most sought tower with a direct access to the beach along with a panoramic view of the Jumeirah Beach, Jumeriah Walk and Marina Walk. 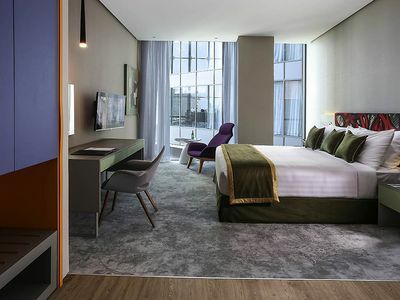 The residents of the tower have a direct access and proximity to the hotel facilities, retail outlets and numerous shopping arcades. Travelling is easy as 24/7 taxi services are provided with the tram and metro stations at walking distance from the location.